Efficiency and flexibility describe the new Grundfos BoosterpaQ. Seven models provide a comprehensive range designed to meet dynamic capacity requirements and maximize efficiency. 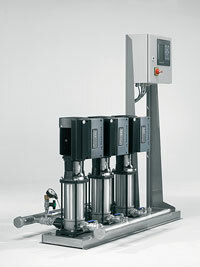 All BoosterpaQ systems are assembled and tested by Grundfos and ready for operation. # Water supply systems for the food industry, such as: poultry and beef processing, breweries, dairies, feed lots, etc. # Recreation: water parks, theme parks, fountains, etc.